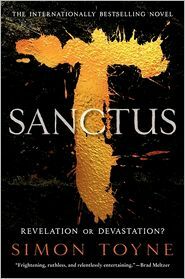 Simon Toyne's debut novel, Sanctus, is one of the September books with a great deal of buzz. It's being compared to Dan Brown's The DaVinci Code. I was lucky enough to have the chance to interview him. So, I'd like to introduce you to Simon Toyne. Lesa - Welcome to Lesa's Book Critiques, Simon. You're a debut author, so my readers won't know you. Would you tell us about yourself? Simon - Hello Lesa, thanks for the invite. I’m tempted to make something up, but you might have a picture of me, so I better keep it honest. I live in England with my wife, two kids (Roxy and Stan) and an Irish Setter called Red. I’m quite tall, a pretty good cook, and – up until recently – worked as a producer and director on British television. Lesa - Tell us about the decision to quit your job to work on this book? Simon - I was pushing 40 and, much as I’d loved working in television, I’d done everything I wanted to do in it. My first love had always been writing, and I spent much of my TV career writing scripts anyway, but I wanted to write something bigger. I wanted to be able to write something that my producer head wouldn’t make me cross out because it would be too expensive to film. In a novel you can do anything you want and your imagination can go places it can’t in an hour of TV. My daughter was also a year off going to school and I was aware that we, as a family, were about to get on that particular treadmill. So we decided to take some time off and go on a little adventure. We rented out our house in England and went to France for six months. I spent every morning writing and afternoons and weekends hanging out with my family. When the six months were up I’d written about a third of the book and took another two years to finish it writing weekends and in between freelance TV jobs. Lesa - Would you introduce us to Sanctus? Simon - “Sanctus” is a fast-paced modern conspiracy thriller, which takes place in America, Turkey and Brazil. It starts with a man escaping from a monastery that houses the oldest relics and secrets of the modern church. This act brings together a number of people, some who want to help and some who definitely don't. Foremost is his sister, who was left alone in the world after he disappeared eight years earlier. In filling in the gaps of those missing years she starts to uncover a powerful secret that has been ruthlessly kept since the beginning of time. It’s a secret that affects all of us and cuts to the heart of everything we believe. “Sanctus” is a mystery, action thriller and is the sort of book that will appeal to readers of Dan Brown, Steve Berry and James Rollins. It also has a strong interest for woman in both its themes and central character. Lesa - Although Sanctus just came out, is there anything you've learned about the book world that you can share with readers or other authors? Simon - Having come from the fairly brutal world of television the major thing I’ve noticed is how much respect writers are given. In TV everyone trashes your work almost constantly, but in the book world it’s nurtured. Also, I’ve started going to literary events where I’ve met other authors. So far the thing I’ve noticed most is how generous and welcoming and just downright nice other crime writers are. You would think they would be twisted and dark, but they’re all just lovely, witty, clever, warm entertaining people. They all tell me it’s the romance fiction writers you need to watch out for. Lesa - What are your plans for future books? Simon - Well Sanctus is book one of a trilogy and I’ve just finished writing the second one. This one is called ‘The Key’ and deals with the aftershocks of the big revelation at the end of ‘Sanctus’. It also follows the developing relationship between the two central characters and has its own big surprise at the end. The final book will bring everything to a conclusion with a shock ending that, I promise you, is even bigger than the one at the end of ‘Sanctus’. Lesa - Is there anything else you'd like to tell readers that I might have not asked you? Simon - My birthday is 29th February so I’ve only had ten proper birthdays. My daughter finds this hilarious and keeps reminding me that she’ll technically be older than me in a few years time. Lesa - I always close my interviews with the same question. I'm a librarian. Do you have a story about libraries or librarians to share? Simon - My first proper girlfriend was a librarian. She used to let me off my late fines and reserve popular books for me. These two things were what I missed most about her when we split up – probably not the most solid foundation for a relationship. Love that story, Simon! I met my late husband at the library, and we always said we only got married to read. Now I know it was because I could reserve the popular books for him! Thank you for taking time to do the interview, and good luck with Sanctus. Sanctus by Simon Toyne. HarperCollins. ©2011. ISBN 9780062038302 (hardcover), 496p. Thanks for introducing Mr. Toyne to us, Lesa! Sanctus sounds like it's right up my alley! Interesting. Best wishes for success of Sanctus and the rest of the trilogy. My pleasure, Karen. I hope you enjoy it! Thanks, Liz. I'm wishing Simon Toyne good luck with the books as well. I admit that I'm a sucker (probably not the best word) for thrillers! This sounds like it's right up my alley. #1 rule for readers' advisory, Bev, is never apologize for your reading taste. You're no sucker. You're a fan! Hope you enjoy it. I always enjoy your introducing us to writers, Lesa. This was a delightful interview. I loved the witty and humorous way Mr. Toyne described how nice crime writers are. I'll definitely have to read his book soon. Thank you, Brenda. I have so much fun "meeting" new authors. I enjoy introducing them to readers. Thanks! I definitely want to read this one. I love a good thriller (no apologies)! Glad there are no apologies, Sheila. I hope you enjoy it.